OK, let's get the gripes out of the way. 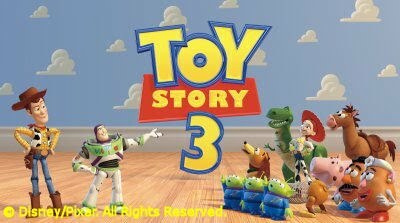 First, "Toy Story 3" is not as good as "Toy Story" or "Toy Story 2." But, then again, Michelangelo's David wasn't as good as the Sistine Chapel ceiling. Second, seeing "Toy Story 3" in 3D is totally unnecessary. The effect is subtle and adds absolutely nothing to the viewing experience. I grow less and less a fan of 3D with each new movie that uses it. The last 3D film I saw that was meaningful was "It's Tough to be a Bug" at Disney's California Adventure. Its silly, in-your-face insect gags are what 3D was meant for--and rightfully housed within an amusement park. 3D is a gimmick, not a medium unto itself. You don't need forced visual depth to appreciate the joy, warmth and emotion of "Toy Story 3," this rare sequel to a sequel that holds its own against its predecessors and brings a satisfying conclusion to the secret lives of toys. 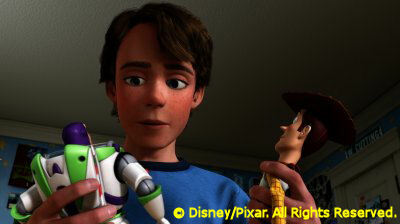 "Toy Story 3" begins as Andy, the long-time owner of Woody (Tom Hanks), Buzz (Tim Allen) and their fellow toys, has grown up and is heading off to college. Still residing in Andy's old toy box, the gang anxiously awaits their fate. Will Andy take them to college with him? Are they destined to be boxed up in the attic or tossed to the trash heap on the curb? These are serious existential questions for toys. And while most of the toys resign themselves to a dismal future, Woody steadfastly believes that Andy will always take care of them. Through a series of mishaps, the toys get carted off to Sunnyside, a daycare center that offers them a toy's dream: the opportunity to be played with always and forever. Sunnyside's toy world is overseen by Lotso (voiced with oily homespun charm by Ned Beatty), a seemingly kind and benevolent plush bear that harbors a dark secret. Among his top assistants is Ken (pitch-perfect Michael Keaton), a vain, shallow clotheshorse of a doll who can't come to grips with the fact that he's just a fashion accessory for Barbie. When this deceptively idyllic existence turns horribly wrong, it's up to Andy's toys to engineer an escape from daycare hell and find their way back to the only real home they've ever known, regardless of what might await them there. As with the best Pixar films (just about all of them, when you come to think of it), story is king, and story guys John Lasseter, Andrew Stanton and Lee Unkrich (who also directed) have crafted a tale that builds logically on the previous two movies rather than rehashes the old material (see: the "Shrek" sequels). The story inspires a screenplay by Michael Arndt that moves along at a brisk pace from fun to danger to sadness to satisfaction. If there's any criticism, it's that these characters have become too familiar, so there are no real surprises anymore, no joy of discovery that came when Woody and Buzz were fresh out of the box. They behave exactly like we expect them to, but we enjoy their company so much that we don't really mind. The themes of abandonment and moving on with your life are prevalent to "Toy Story 3," so it's a much darker and sadder experience than the earlier films. The emotion is never belabored, though, and the movie keeps plenty of funny and light moments peppered throughout (Buzz's involuntary turn as a swashbuckling Spanish Lothario is a gem). But, keep the Kleenex handy. As decisions are made and goodbyes are said, the last half-hour will get to you. 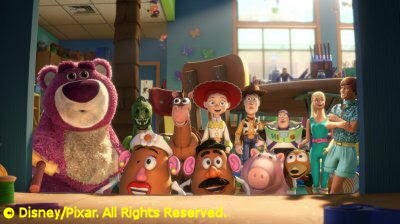 With "Toy Story 3," Pixar does it again. Do these guys even know how to make a bad movie? Just save your money and see it in 2D, ok?